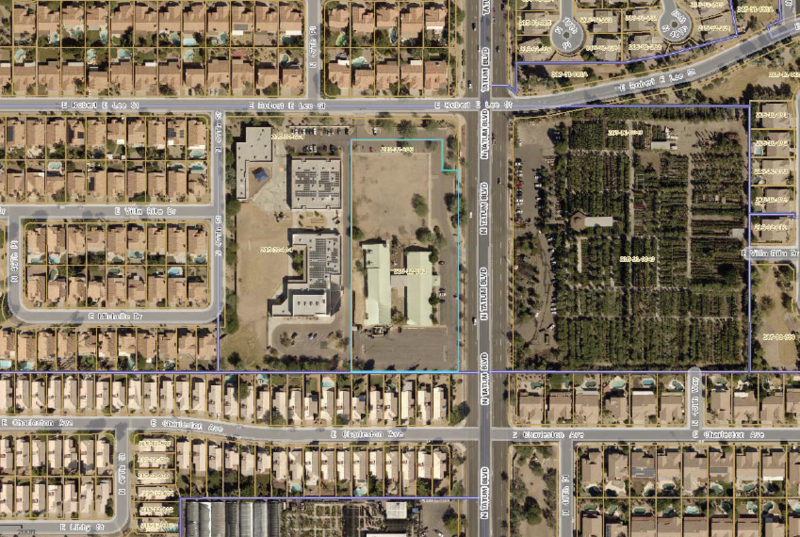 A proposed new senior living facility is one harbinger of many changes to come along Tatum Boulevard north of Bell and south of Loop 101. A mix of big-box anchors and smaller retail operations cover three of the four corners at Tatum and Bell. The NWC is home to a large multifamily development. Another multifamily complex sits immediately north of that one, and a third lies just east of the NEC. Stretching north to the 101 is an expansive collection of single-family homes, mostly built between 1990 and 2005, with few other development types mixed in immediately touching Tatum. The immediately Tatum-adjacent items are a non-denominational church/meeting center, a Circle K, two plant nurseries, a small medical office/urgent care, a formerly city-owned and now privately run horse park, a luxury senior living complex set well back from the road, and the Musical Instrument Museum. Because of the density and the lack of infrastructure and density management/capacity improvements planned for Tatum and Grovers the proposal was rejected. Residents breathed a sigh of relief, but many remained suspicious of what was to come. On Saturday, Nov. 24, many area residents found anonymously placed found fliers on their doors announcing plans to demolish the church/meeting center facility and replace it and the vacant lot next to it with a four-story, 210-resident senior living and memory care facility. The fliers urged residents to contact their city council representative and Valley Village planning staff to express opposition. On October 15 a Planned Unit Development request was filed with the city by Tiffany & Bosco, P.A. on behalf of TB-AZ Management Company, LLC to create MorningStar of North Phoenix on the current church site. The 3.44-acre site is currently zoned R1-18. The unit breakdown under the proposal will consist of 90 independent living, 45 assisted living and 25 memory care units for a total of 210 beds in 160 rooms . In arguing for the change request, the applicant argues that while the property is currently designated as Residential 3.5 to 5 du/acre (Traditional Lot) in the General Plan Land Use Map, lots fronting arterial roads are not usually zoned single-family residential and point to the multifamily developments south on Tatum as an example. On Monday, Nov. 26, a representative of Shea Connelly Development told AZBEX Research staff no construction timeline has been established. The City of Phoenix currently shows no hearings or meetings as scheduled for the proposal. Many residents of the area near the proposed MorningStar development were unaware of the proposal until the fliers were posted. When asked, they were almost universal in their concerns about this project and the general growth planned for the area along Tatum. The most common concerns regarding MorningStar specifically were the height of the proposed development, which would be nearly twice as tall as anything in the immediate vicinity, and traffic impacts, particularly on residential side street Robert E. Lee Street, which is the site’s northern boundary. A charter school sits immediately west of the proposed site on Robert E. Lee. Residents have long expressed displeasure with the volume of traffic on Robert E. Lee during pickup and drop off times, and they fear the new development will exacerbate the issue. It’s not just the senior facility that has residents worried, but the entirety of planned development for the immediate area along Tatum between Bell and the 101. After Shea Homes’ proposal fell through, developer DR Horton submitted a new proposal to create 420 single family and 286 attached single-family duplex units on the same site at Tatum and Grovers. The City’s Paradise Valley Village Planning Committee staff recommended the proposal for approval in September of this year. “Horton was a lot smarter about it than Shea was,” the resident said. “Shea tried to drum up community support and did a lot of outreach. Horton kept it as quiet as possible, and it pretty much sailed right through even though it’s still way too big for the neighborhood to support.” City documents appear to confirm a lack of organized opposition to the proposal, with only four emailed responses attached to the staff report. The area near the Mayo Clinic is also envisioned as a potential biomedical corridor. N-Shea Group LLC is the project owner. Development is by N-Shea Group LLC and MorningStar Senior Living. The architect is Rosemann & Associates, P.C. Shea Connelly Development LLC is the general contractor.